EIZO today announced the FORIS FS2434, a 23.8-inch gaming monitor with a slim 6 mm frame. 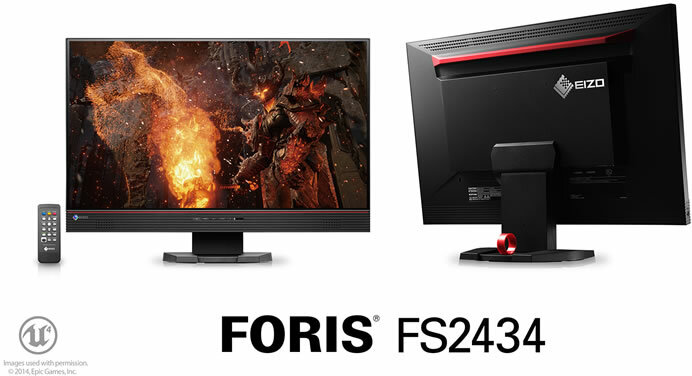 The FORIS FS2434 also offers vivid display of color and EIZO-developed Smart technologies for more enjoyable gaming. The monitor is ideal for RTS, MOBA, and MMORPG genres of PC gaming as well as console game genres of all types. To ensure visual comfort while playing games over long stretches of gameplay, the LED backlight is controlled with a hybrid of DC (direct current) and high-frequency PWM (pulse-width modulation) for flicker-free viewing at all brightness levels. The 6 mm frame (2 mm bezel and 4 mm border at the edges of the LCD panel) along the sides and top of the monitor create almost seamless viewing in a multi-monitor environment for a more immersive gaming experience. Colors remain vibrant with little change in contrast even when looking at the screen from an angle due to the IPS (in-plane switching) LCD panel and its 178° horizontal and vertical viewing angle. Input lag is an extremely low 0.05 frames so there is no delay between the time a signal is input into the monitor and shown on the screen. EIZO has simplified adjusting of the screen settings by including both a remote control and its own G-Ignition utility software (Windows 8, 7 and Vista compatible). Two HDMI and one DVI-D port provide connectivity with PCs, consoles, Blu-ray players and cameras. A USB 3.0 hub with one upstream and two downstream ports lets users connect to USB 3.0-compliant storage devices or connect their mouse and keyboard to the monitor. A line-out jack for connecting to external speakers and a headphone jack provides further functionality. The FORIS FS2434 comes with seven preset modes making it ideal for other entertainment content in addition to gaming such as viewing videos, photos or the Web. An ergonomic stand allows for positioning the screen at an angle most comfortable for the user. The stand includes 60 mm of height adjustment, 25° of tilt and 344° of swivel. The monitor can also be mounted on a VESA-compatible stand. A handle on the backside makes it simple to carry the monitor to a gaming event. The FORIS FS2434 will begin shipping in late June.